New research suggests that astronauts' red blood cell count may not drop during extended missions as previously thought. Astronauts' blood changes in space — but that may not stop them from getting to Mars. SpaceX founder Elon Musk often boasts about the imminent colonization of Mars, despite major human health problems that stand between us and the Red Planet. Fortunately for Musk and other aspiring space travelers, NASA scientists may have crossed one item off that list of potential problems. "If our astronauts start landing other places like on the moon, or [on] Mars, if they get off the spaceship and they don't have enough red cells, they're going to get very winded and fatigued," said Kathleen McMonigal, co-author on the new study and a pathologist and director of clinical laboratories at NASA's Johnson Space Center. "We need them to be in absolute tip-top shape to go off and explore their new surrounding terrain," she told Space.com. In a new study published Sept. 8 in the journal BMC Hematology, McMonigal and other NASA researchers analyzed blood samples from astronauts drawn over the course of six-month missions to the International Space Station. The study authors believe this was the first time NASA researchers on the ground had analyzed the blood of astronauts still in space. 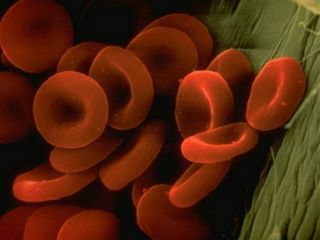 Researchers based previous findings about spaceflight anemia on blood drawn before and after a mission, but not during. The team found red blood cell counts and other factors related to anemia seemed to go up slightly and then stabilize over the course of spaceflight, rather than dip, as was assumed. Astronauts who spent more time in space actually seemed to have more stable red blood cell counts during spaceflight, not less, according to the study. "The big thing I want to point out is that most everything looks really, really normal," McMonigal said. The difference seen in blood drawn before and after the mission could be the result of the extreme dehydration astronauts experience during re-entry, which would affect several parameters measured in the blood, according to McMonigal. It could also be related to blood plasma volumes (the amount of liquid in the blood) fluctuating as the body readjusts to gravity, Brian Crucian, a NASA scientist and lead author on the study, told Space.com. The scientists were not able to analyze blood plasma directly in this study due to operational constraints, Crucian said — from the space station, the blood samples flew first on a Russian craft to Kazakhstan then to the United States for analysis. This timing meant researchers had to wait 37 hours to run tests they would typically perform immediately after drawing blood. In the past, researchers have seen the amount of plasma in the blood decline in microgravity and rise again when astronauts return to Earth, according to Jay Buckey, a former astronaut and professor of medicine at Dartmouth, who was not affiliated with the study. Blood with more plasma could measure as having fewer red blood cells, and less plasma as having more red blood cells. Buckey likened the phenomenon to boiling salty water over a stove: as some of the water boils off, the ratio of water to salt changes and the solution becomes saltier even though you haven't added more salt. This observation could explain previous results and mean astronauts might still need time to adjust when landing on planets, asteroids and moons, even if they aren't anemic during the flight. Crucian and McMonigal found red blood cell levels and other blood measures returned to preflight levels a month after astronauts returned to Earth. However, in the study they note more research is needed to understand what's happening in astronauts' bodies during that 30-day window. "The thing is, they're going to have a little adaptation to go through to go from being weightless to being back in a gravity field again," Buckey told Space.com. Still, better understanding blood in space brings would-be intrepid explorers one step closer to Mars City.